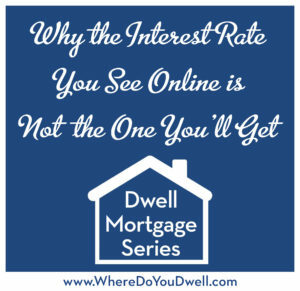 This week you’ll learn why the interest rate you see advertised online is not the one you’ll get. There are many factors that go into coming up with the interest rate you’ll get from a lender. 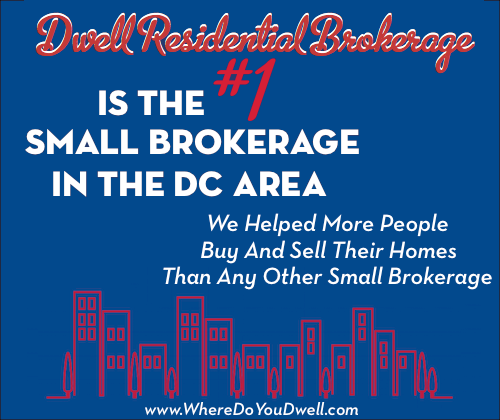 This is a perfect overview of what you need to know about as a buyer. You see and hear about interest rates online, on the radio, and TV. So when you call a mortgage lender, you expect to get the interest rate you heard about. Ninety-nine percent of the time, the interest rate you are seeing around town will NOT be the interest rate you get! Let’s cover the basics first. Interest rates for mortgages can fluctuate on a daily basis, going up or down. Freddie Mac posts the average U.S. rate for popular mortgages every Thursday after surveying lenders across the country. These are the rates that you’ll see or hear about in news media reports, especially when the 30-year fixed rate hits a record low. Mortgage lenders promote their own interest rates on their websites. However, what you see isn’t necessarily the one you’ll get. Usually these “promo” rates are really an average of rates that they offer, and you’ll need to read the fine print to find out any restrictions or requirements. Most lenders offer several mortgage products, some better (less costly) than others. So don’t assume anything just yet! Credit Score – Your score and credit history play a huge role in what rate you’ll be offered. (We discussed that in Week 4 of our series.) It lets lenders know if you’re a good risk or not as a borrower. A high score of 740 or more means you’ll get a lower rate since you’ve proved you’ve handled credit responsibly in the past. Even if your score is considered “good” — which would be anything above 700 — you’ll still have a higher interest rate if it’s not 740 or above. Also, the lower your credit score, the higher the rate since you’re viewed less credit worthy. Down payment – There are different rates depending on how much you put down. The larger your down payment, the lower the interest rate because the loan is deemed less risky to the lender. A bank views your loan more positively if there is more equity in your home. To qualify for some of the best mortgages, you need to be able to put down 20%. If you put 25% down, you get an even lower rate. If you have less than 20% down, your interest rate will be slightly higher and you might also have to add private mortgage insurance (PMI) to your monthly mortgage payment. However, we like to stress that you can still get a good loan for less the 20% down – that’s why you need to shop around for a lender. We can help with that. Type of Property – Did you know that condos have slightly higher interest rates then single-family detached homes? A condo loan could be .125% to .375% higher since lenders view condos as more risky since other condo owners and your homeowner’s association are involved as well. So, if you buy a single family home, your interest rate will usually be lower than if you buy a condo. Just how it is! Different Products – The interest rate also depends on the mortgage product. There are jumbo loans, FHA loans, VA loans, adjustable rate loans, and conventional loans — all of which have different rates, fees and requirements. Again, you need to shop around since every lender can offer different loan products and requirements. Also, keep in mind, some lenders will offer products tied to first-time buyer assistance programs. Loan Term – Usually loans with a shorter term have lower rates. A 15-year fixed rate loan will be lower than a 30-year fixed. ARMs, which have grown in popularity because of better regulations, will have an even lower interest rate. Loan Size – Larger loans usually have higher interest rates. If you need to borrow more, the loan is considered riskier. Jumbo loans also require larger down payments. As you can see, if you have one of the contributing factors listed above, your rate will be much higher than what is advertised out in the world. So, just be prepared. Want to know the easiest way to compare lenders? It’s called an APR, which stands for Annual Percentage Rate. This APR number reflects the true cost of the loan. It includes any fees incurred for the cost of obtaining the loan. Closing costs, any points, and an origination fee are used to come up with the APR, along with the actual mortgage rate you’re offered. It will be a higher rate than the interest rate alone. Here’s where you really need to look at the details (and fine print) to see what each lender is actually offering so you are comparing apples to apples! For example, a lender may offer a low interest rate but will charge 2 points. Or the lender may offer you a higher interest rate with no points. How do you know which is best or the “cheapest” money to borrow? Just look at the APR. It might even be the offer with the higher interest rate. It has the lower APR since the lender is not charging you for any points. As you can see, there’s a lot that goes on in coming up with an interest rate. So don’t be fooled by the online rates advertised by lenders. You need to talk or meet with lenders to go over the best options for you and your situation. Next week’s article, How to Get the Best Interest Rate in Town, will go into more detail on what you must look out for and consider when getting a mortgage. Plus, we’ll share Dwell Residential’s secret on getting the best rate. It’s a must-read!